The tantalum 4f peak is fit with a doublet of peaks with a 4f7/2 - 4f5/2 area ratio of 4:3 (i.e. the 5/2 peak is 0.75 X the 7/2 peak). The doublet peaks for the metal and Ta2O5 are sufficiently separated that their FWHM (full-width at half maximum) and energy positions can be left unconstrained during fitting. The metal peaks must be fit with an asymetric peak-shape (either LA(1.1,7,25) or A(0.38,0.7,10)GL(10)). When both metal and Ta2O5 are present a sub-oxide species should be fit with a constrained doublet with FWHM equal to the Ta2O5 peaks (or contrained to a maximum FWHM of similar value as the Ta2O5 peaks FWHM) and having an energy separation of 1.91 eV. Binding energy values are presented in Table 1. Table 1. Tantalum 4f7/2 binding energy values (literature averages from Ref. 1). Figure 1. An example of a Ta 4f peak with with metal, sub-oxide and Ta2O5 species. 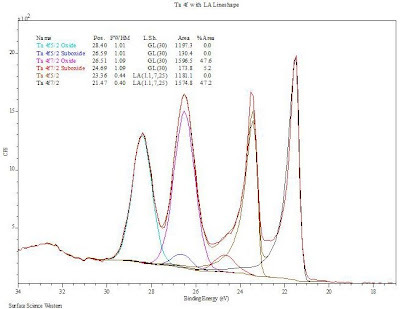 A CasaXPS ready example of a fitted Ta 4f metal/oxide spectrum using the two different metal line-shapes can be found at: (A-GL)and (LA).